One postcard story was about a 1906 view of the Market Square building decorated for the Farmers National Congress. 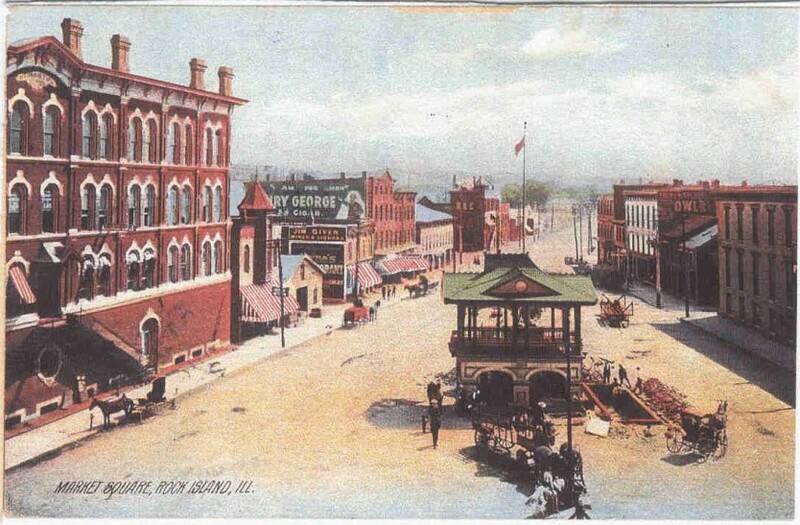 This is another postcard from the same era, but with a completely different view, that shows Market Square’s surroundings on 17th Street, looking south from Second to Third Avenues. 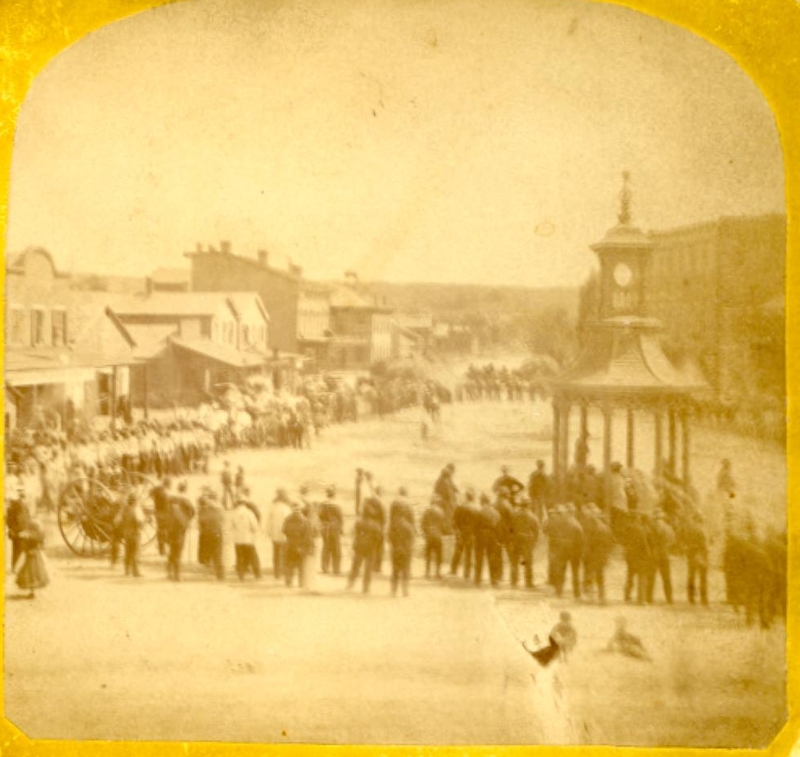 Market Square wasn’t really a square, it was a triangle. It was not landscaped and consisted of mostly open space. Its most important improvement was a water pump. In 1868, the editor of the Rock Island Daily Union said that the city should put a town pump here, preferably in a “neat, durable” enclosure with four entrance and a “tasteful and ornamental” roof and noted that water would be useful to farmers and handy in case of fire. In 1874, only a few years after city water mains had been installed but before the river water was purified, a drinking fountain and horse trough were installed. Folks were pleased with the result, but noted that the trough was too small. One 1870 stereoview depicts a graceful columned open structure with a bell atop. It was replaced some years later with the more impressive structure shown on our postcard. What went on in the buildings surrounding Market Square? The street level stores housed plumbers and restaurants, saloons and harnessmakers, gunsmiths and more saloons. And then there were hotels. Originally, the hotels were used by the farmers and other transients who came to town. Single men maintained permanent residence in a hotel. But as the century advanced, some hotels deteriorated into little more than brothels or gambling houses. The large building in the left foreground of our postcard is the Bengston Block, which is still standing although missing its top three stories. Next to it is a towered building that operated as a saloon for many years. Beyond is a streetcar barn, which later became a feed and seed store. The upper stories of the four tall buildings at the far end of the block were hotels with names that changed every few years. Among the names used were Commercial, Independent, Pullman, Richardson, Market Square, Ritz, and on the far corner, the Sherman. The old Sherman Hotel is now a parking lot, but the other three hotels are still standing, one with an added story, all with changed cornices. On the west side of the street (right on the postcard), the large building in the foreground was the Schafer House hotel. It was removed in the late teens for an Illinois Oil Products gas station. The other multistory buildings offered even more hotel space on the upper floors. By the 1920s, the fancy Market Square pump building on the postcard had been removed and only a drinking fountain and small watering trough remained. Photos taken in the 1930s show Market Square as mostly a large parking lot, its market function no longer needed. In 1964, the buildings on the west were razed so that a new Sheraton hotel could be built. The new hotel also covered half of the old market area leaving only a street width open. The story of Market Square seems to be just that of a utilitarian trading arena that outlived its utility. But there was a bloody history to Market Square as well. And John Looney is the man credited with that crimson image. In the first quarter of the 20th Century, Looney published the Rock Island News, yellow journalism at its worst, for the purpose of blackmailing local citizens. If a man didn’t give in to Looney’s demands for payment, he’d find his name in the paper, libelously claiming he was involved in some scurrilous dealings. John Looney was involved in other illicit vices, from prostitution to gambling, with murder, mayhem and revenge added as required. Many local politicians and policemen were on his payroll. His story – what we know of it – is too long to tell here. But two major events in Market Square involved John Looney. In 1912, the square was the scene of a huge riot as Looney’s henchmen got 1500 people attending a rally in the square angry enough to storm city hall to protest Looney’s recent beating at the hands of Mayor Schriver. 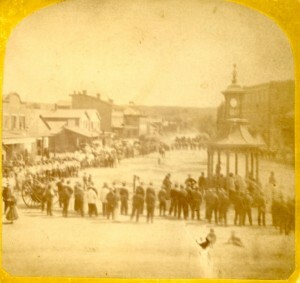 Ultimately, martial law was proclaimed, with 600 militiamen arriving to bring peace to Rock Island. Looney’s other bloodshed in the square took place on October 6, 1922, when four of his former friends and partners in crime turned against him. They went to the Sherman Hotel – a gang hangout which Looney owned – intending to gun down both him and his bodyguard son, Connor. Looney escaped, but Connor died in the shootout. The four men were captured and sent to prison, while Looney escaped to his ranch in New Mexico. After he was charged with conspiracy, “wanted” posters were posted near his known hangouts. A New Mexico neighbor recognized him on a poster and he was arrested. He was returned to Rock Island for trial and sent to jail in 1925, with a sentence of 14 years. Although eventually released, he never returned or achieved his former notoriety. The Sherman Hotel must have gained a bad reputation as a result of the shootout, too. Although still a hotel, the address no longer was listed as 17th Street, instead it used the other entrance address on 3rd Avenue. Its name changed as well, from Sherman to Richardson. Fifteen years later, the address was once again listed as 17th Street. It is also interesting that, in the early 1920s, the Sherman House held a “Java House” in its 17th Street and 3rd Avenue corner. However whether it specialized in coffee or other “beverages” during these early prohibition days is open to speculation. But perhaps John Looney had the last laugh. His nefarious legend has been the inspiration for books and film. “Road to Perdition,” a movie starring Paul Newman, Tom Hanks, and Jude Law, is based on a novel written by Max Alan Collins. It is a very loose interpretation of the circumstances surrounding the death of Connor. NOTE: In 1909 Architect George Stauduhar submitted drawings for a new Market Square bandstand and weighing station to Mayor George W. McCaskrin. It was to be constructed of pressed brick with stone trim and a widely overhanging roof and was expected to cost $3000. It was designed with two stories plus a basement containing toilet rooms and was 20 feet square. Part of the ground floor was an office for the weigh master while the rest had a waiting room for street car passengers. This structure does not appear to have ever been built. This article by Diane Oestreich is slightly modified from the original, which appeared in the Rock Island Argus and Moline Dispatch on July 7, 2002.